Greek Sliders - Home. Made. Interest. A BIG Thank You! To True Aussie Beef & Lamb who provided us with a Big Green Egg and amazing Aussie Lamb for this post. 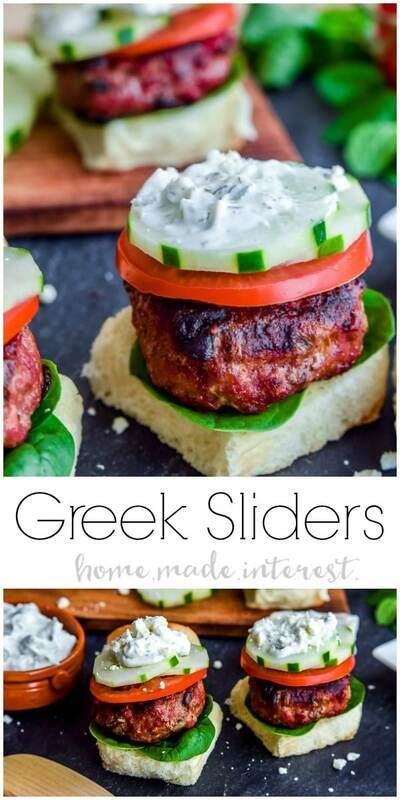 These easy Greek Sliders make an awesome easy appetizer recipe for a cookout or game day. Today is a continuation of our Two Chicks and Their Big Green Egg summer grilling series. If you missed Part 1 make sure you head over and check it out! We made a lot of easy slider recipes here on Home. Made. Interest.. We just can’t get enough of them! From Chicken Parmesan Sliders to Philly Cheesesteak Sliders we’ve turned some of our favorite recipes into simple slider recipes that are perfect for parties. This week we’re going back to basics with these grilled Greek Sliders. We made them to go with our Herb Crusted Grilled Leg of Lamb at the cookout we hosted a couple of weekends ago and they were a huge hit. Our Greek Sliders are made from Aussie beef mixed with Kalamata olives and red onion. Guys, I can’t tell you how much fun we’ve been having with the Big Green Egg and all of the amazing lamb and beef that True Aussie Beef & Lamb sent us! Most of you probably don’t think of beef as coming from Australia, at least I know I didn’t, but Australia’s unique climate and environment allows cattle to live in their natural state and produces a consistent supply all year round. I was really impressed with the quality of the Aussie ground beef we used for the Greek Sliders and if how quickly they disappeared off of the platter is any indication so was everyone else. 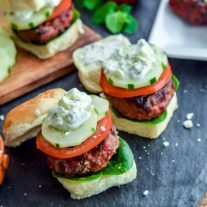 These easy Greek sliders are packed full of flavor and topped with creamy tzatziki sauce. It is an amazing recipe for parties! 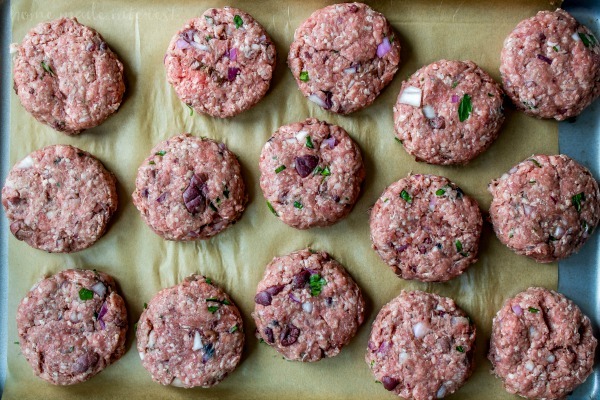 Combine ground beef, olives, red onion, parsley, garlic powder, salt, and pepper in a bowl. Pat burger mixture into 4 oz patties. Heat grill to high heat and place burgers on grill. Cook until medium rare ( or desired level of doneness). 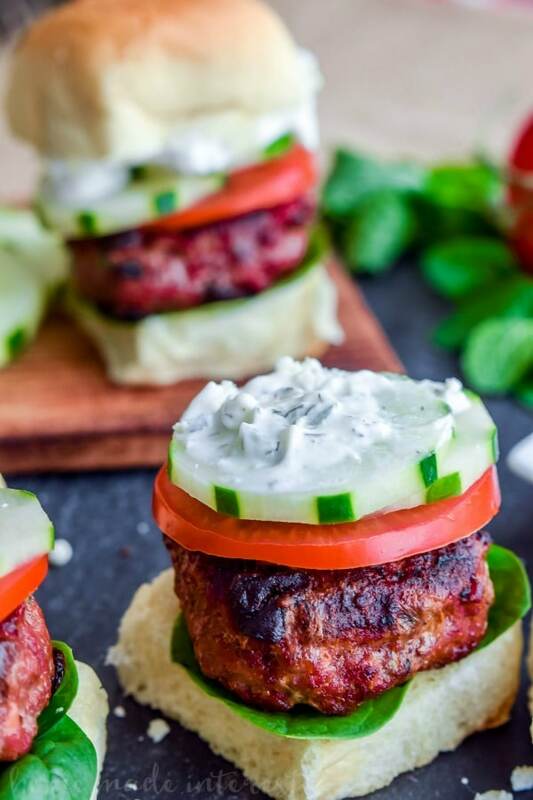 Place burgers on slider buns and top with cucumber, tomato, spinach, and tzatziki sauce. These look amazing, will definitely have to try! Aside from the cucumber, this recipe seems to be delicious! Will definitely try making it this week!